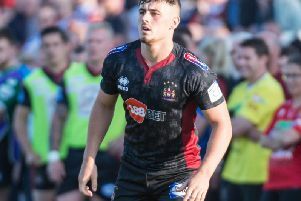 A Manchester nightclub could be stripped of its licence as councillors gather for an "emergency" meeting following a violent incident at the weekend which left a teenage St Helens RL player in hospital with a serious head injury. The future of the club hangs in the balance after a video emerged of bouncers attacking a group of teens, including the young Saints ace. Academy player Joe Sharratt suffered serious head injuries and was taken to hospital after the incident outside Factory nightclub at the weekend. Speaking to the BBC, Mr Sharratt's parents, Jane and Brian, said their son was recovering and "making a few jokes... which is a really good sign." They said Joe was a "lovely lad" and getting the call about the incident was "probably the worst nightmare". The incident went viral after mobile phone footage of the incident was shared on social media. Joe is seen to be punched to the ground, where he remained unconscious while as many as eight other bouncers continue to throw punches at his friend Leon Cooper. Leon, also 18, a pharmacy student at Manchester University, told the BBC that one of the door staff ran at Mr Sharratt, and then several bouncers "started jumping on" him. Describing the attack, he said: "I tried to help him but they were just hitting me. "I wasn't trying to attack them ... I was just trying to get to my mate." Pat Karney, councillor for Harpurhey and Collyhurst, has since announced that the licensing committee will meet to discuss the incident. In a Tweet he said: "An emergency licensing committee will be held Wednesday to review the licence. The club owners will be summoned in. We are working closely with GMP." Yesterday, nightclub bosses confirmed they had terminated their contract with Professional Security, the firm which employed the bouncers. Shortly after, the company revealed that all of the doormen involved have been sacked.